James David Christie has been internationally acclaimed as one of the finest organists of his generation. He has performed throughout the world in solo concerts and with major symphony and period orchestras under such conductors as Kurt Masur, Klaus Tennstedt, Gunthur Schuller, Edo de Waart, Arthur Fielder, Colin Davis, Andrew Davis, Roger Norrington, Sir Simon Rattle, Philippe Herreweghe, Trevor Pinnock, Seiji Ozawa, Robert Craft, Robert Spano, Andrew Parrott, Christopher Hogwood and Joshua Rifkin. He has performed and recorded with major symphony orchestras in New York, Boston, Philadelphia, San Francisco, Seattle, Baltimore, Koblenz, London, Stuttgart, etc. He has also appeared internationally with many period instrument orchestras and serves as Artistic Director of Ensemble Abendmusik, a Boston based period instrument orchestra and chorus that specializes in sacred music of the 17th century. He has premiered major contemporary works by Anton Heiller, Daniel Pinkham, Ned Rorem, Thea Musgrave, George Crumb, Ellen Taafe Zwilich, Jean Langlais and P.D.Q. Bach (for the 100th anniversary of the Boston Symphony Pops with John Williams, conducting). James David Christie is Professor of Organ at the Oberlin Conservatory of Music, the Distinguished Artist-in-Residence at the College of the Holy Cross, Worcester, MA, and Curator of Organs and Organist at Wellesley College. He has served as organist of the Boston Symphony Orchestra since 1978 and recently performed for the dedication of the newly rebuilt organ in Symphony Hall, Boston, under Maestro James Levine and toured with the orchestra to Carnegie Hall. He served for twelve years as Artistic Director of the International Artists Series at Mechanics Hall, Worcester. He has been a visiting professor of organ at the Paris Conservatory, the Vienna Conservatory, the Sion Academy of Music, the McGill Organ Academy and the Cracow Academy of Music. He served as Professor of Organ at both the Boston Conservatory and Boston University before accepting the position at Oberlin. 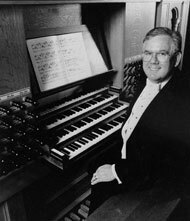 In August of 1979, James David Christie became the first American to win First Prize in the International Organ Competition in Bruges, Belgium; he was also the first person in the eighteen-year history of the competition to win both the First Prize and the Prize of the Audience. Since then, his students have been prizewinners in major international competitions in the United States, Canada, Europe, South Africa and Japan. Just this past month, three of his students were prizewinners in U.S. national organ competitions and three others were invited into the final rounds of three major international competitions, which will take place later this year. He has served on juries for the American Guild of Organists, the Cambridge Society for Early Music Competition, International Organ Competitions in Bruges, Amsterdam, Lausanne, Worcester, Columbus, Speyer, Erfurt, Leipzig, Paris, Bourdeaux, Chartres Cathedral, Calgary, Dublin, St. Omer-Wasquehal, Kaliningrad (Russia) and numerous conservatory juries in France, Belgium and Canada. James David Christie was awarded an honorary Doctor of Fine Arts degree from the New England School of Law in 1980 for his outstanding contributions to the musical life of Boston. He is a graduate of the Oberlin Conservatory and the New England Conservatory, where he was recently awarded their Distinguished Alumni Award. He has traveled extensively throughout Europe studying historic instruments and doing research in musicology.